So glad Halloween is over. READY FOR CHRISTMAS!!!!!!!!!! @aqsielaine ayan, gumagana na emoji mo! “@tori_traxler: I talk to @Mini_McPhail15 everyday. But I'm not complaining. #bestfriends” for real. I'm right there with ya! 31 Oct 11 copy & paste +upvote -downvote “@tori_traxler: I talk to @Mini_McPhail15 everyday. But I'm not complaining. #bestfriends”  for real. I'm right there with ya! @ShahadiLove Ameen! Shukran Hun! I'll try to enjoy my day!! Me & Yannik both wore our Obey leather jackets today. The main thing I missed about the iPhone was emoji. .
01 Nov 11 copy & paste +upvote -downvote The main thing I missed about the iPhone was emoji. . What channel ?! RT @_oliviabieber: Ahhhh remember the titans is playing ! 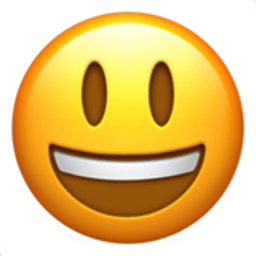 Like Smiling Face with Open Mouth Chronological Emojitweets 40?